Most people at this point are likely aware that sous vide cooking is the best way to make food that’s consistently delicious. By sealing the food in an air-tight pouch and slow-cooking it at the target temperature, you ensure that it’s always cooked to the perfect doneness and that all the flavor is locked in, since it has nowhere to go. What many people don’t realize, however, is that sous vide cooking isn’t reserved for solely for top chefs in fancy restaurants. The three most popular sous vide precision cookers on the market right now have all gotten deep discounts for Black Friday. 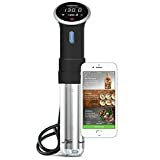 The Anova Culinary Sous Vide Precision Cooker with WI-FI + Bluetooth is our favorite model, and it got a huge $100 discount. 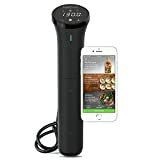 The less expensive Sous Vide Nano is also on sale at its lowest price yet, and the ChefSteps Joule Sous Vide is available for $144 for the next few days. You can’t go wrong with any of these great sous vide machines, so grab one while they’re on sale.